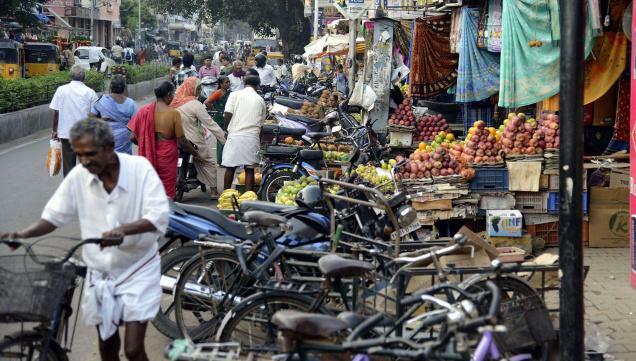 The Chennai Corporation plans to remove encroachments on pedestrian facilities in all the 15 zones of the city. As a step towards removal of encroachments, the civic body will start a survey of all the encroachments on footpaths along bus routes and interior roads in all the 200 wards. The recommendation was made at the first meeting of the sub-committee on infrastructure improvement and promotion of non-motorised transport chaired by the Chennai Corporation Commissioner. The State government had constituted three such sub-committees to help shape the Chennai Unified Metropolitan Transport Authority (CUMTA). “We have given two weeks time to complete the survey. After the survey, the removal of encroachments will be made on case-by-case basis,” said Corporation Commissioner D.Karthikeyan. The sub-committee has representatives from traffic police and Chennai City Connect. CUMTA was notified by the State government in 2010. The other two sub-committees under CUMTA would look into resource mobilisation strategies and integration of public transport modes. According to officials, the discussion of the sub-committee on Monday focussed on steps to be taken towards enhancement of operations of the non-motorised transport and also improving road infrastructure. “The non-motorised transport infrastructure includes bicycle tracks. We will select such projects too. All the work on bus route roads to be carried out in the 15 zones will include footpath and other pedestrian facilities,” said Mr.Karthikeyan. The plan to create a dedicated cycle track on a 6.5-km stretch in Anna Nagar has been put on hold because of Metro Rail work. Such pedestrian facilities and non-motorised transport will be in place after metro rail work gets completed, officials said. The sub-committee will soon come up with proposals to develop a hierarchy of tracks that cyclists and pedestrians can share space in many stretches. “This will be the last-mile connectivity. This would facilitate less congestion in smaller roads,” said Raj Cherubal of City Connect. “There is a need for regulation of encroachment on footpaths. We are ready to support any initiative if it does not affect the livelihood of lakhs of street vendors in the city,” said V. Mageshvaran, Secretary, National Association of Street Vendors of India. “The model adopted in states such as Orissa can be followed in some congested areas of the city. One-third of a 9-ft footpath is earmarked for vendors there,” he added. “There are more than one lakh street vendors in Chennai. Many people live on pavements also. Any action should not affect the livelihood of street vendors,” said V. Geetha, adviser of Unorganised Workers Federation. According to the Comprehensive Traffic and Transportation Study done by the CMDA, only about 20 km of the city’s road network has a 1.5-metre-wide footpath. The recommendations of the sub-committee on infrastructure improvement and promotion of non-motorised transport will focus on increasing footpaths and cycle tracks. « What is Making China Fat?